In the Kimberley’s (Northern Territory) indications show aboriginals may have inhabited Australia for more than 116,000 to 176,000 years and they had arrived by watercraft. However, conventional belief is that they arrived between 40,000 and 70,000 years ago. Australia has always been separated by at least 60 kilometres of water since the glacial maximum of 140,000 years ago - yet smoke from bushfires could have easily alerted those living north of the continent of its existence. The Sydney region, referred then by the local aborigines as Warrane, itself has been inhabited for at least 50,000 years. Only recently have 50,000 year old grindstones been found in the area, predating any previous finds worldwide. Does this mean bread-making was invented here? See more about Aboriginal Arts and Culture. The west and north coast of Australia had been visited quite frequently by Europeans in the 17th century. The east coast was first charted by Europeans, in 1770, by the well known Pacific explorer, Captain James Cook. On April 29, 1770, on Possession Island, he claimed the whole east coast for King George III and called it New South Wales. The British did nothing about their new aquisition till after a number of years, when at the urgings of Joseph Banks (the botanist with the Cook expedition), decided to establish a colony in this far flung corner of the earth. "By the discoveries and enterprise of our officers many new countries which know no sovereign, and that hold out the most enticing allurements to European adventurers. None are more inviting than New South Wales"
In no small measure this was due to the American War of Independence preventing Britain sending her convicts to the American colonies. Some of the more unusual crimes that people were convicted of and sentenced to being sent to the colonies included setting fire to underwood and stealing children with their apparel. The history of Australia began when The First Fleet, commissioned by Thomas Townshend, Baron Sydney, set sail for Botany Bay on May 13, 1787. Led by Captain Arthur Phillip, the fleet comprised of the frigate HMS Sirius, four storeships, the armed tender Supply, the Golden Grove, Borrowdale, Fishburn and six transports, the Scarborough, Lady Penrhyn, Friendship, Charlotte, the Prince of Wales and the Alexander. The fleet assembled at Mother Bank, the Isle of Wight, later arriving at Cape Town to take aboard plants, fruit trees and animals. The HMS Supply, along with the ships Scarborough, Friendship and Alexander sailed ahead of the fleet, first sighting the NSW coast on the 3rd of January, 1788. They arrived at Botany Bay on the 18th of January, where upon anchoring, it was discovered there was no fresh water locally available. When the rest of the fleet arrived early on the 19th, much to Phillip’s surprise, it was decided to go further north, to Port Jackson (now known as Sydney Harbour). 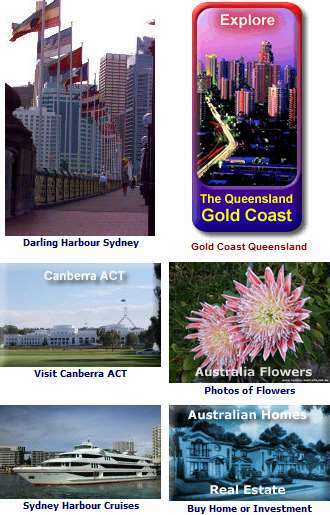 See Sydney Harbour Map. There, they were to find a lush pristine forest in a cove of the harbour. Fed by a stream (now called the Tank Stream) they decided to settle here. See Sydney Cove. * The First Fleet’s journey from Britain involved 11 sailing ships, covered 24,000 kilometres of ocean and took 8 months. This can be regarded as the 18th century equivalent of going to the moon. * The First Fleet initially planned to settle at Botany Bay. Arriving in January 1788, the fleet carried 759 male and female convicts from Britain’s overcrowded jails, 400 sailors, four companies of marines, enough livestock and supplies for two years and also one stowaway on board! A few days later, disappointed with Botany Bay, the fleet sailed 25 kilometres north to Port Jackson, more commonly now known as Sydney Harbour. * The day the First Fleet landed at Port Jackson, on the 26th of January, is now celebrated every year as Australia Day. A formal flag raising ceremony was held by Arthur Phillip on the shore to proclaim the Colony of New South Wales, in the name of the King of England on the 26th of January, 1788. This day is now celebrated as Australia Day. Captain Arthur Phillip was later to name the cove they landed at, Sydney Cove, in honor of Thomas Townshend, Baron Sydney (1733-1800) the minister responsible for the Colony. Later usage dropped the word ’Cove’, although it is still the name of the cove. The Sydney Opera House, the Harbour Bridge and Circular Quay have all been built on Sydney Cove’s edges. Ferries and jetcats still use it today. It is as still important as it was then as a centre of activity for the city. 50,000BC - 15,000BC - various aboriginal sites around the Sydney region. 1770 - Captain Cook arrives at Botany Bay. 1778 - Penal Colony of New South Wales established by the arrival of the first fleet. 1808 - The infamous Rum Rebellion overthrows the then Governor, William Bligh. 1840 - Due to pressure from the citizens of Sydney, England stops transport of prisoners. 1842 - Sydney becomes a City. 1852 - Gold discovered! Massive influx of people from all over the world seeking their fortune. 1888 - Town Hall opened. 1901 - Australia becomes a Commonwealth. 1932 - Sydney Harbour Bridge is completed and Opened. 1973 - The Sydney Opera House opens its doors. 2000 - The Sydney Olympic Games held. 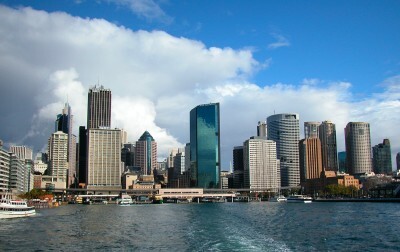 About Sydney and Australia Places to Visit.